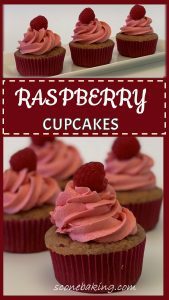 If you love raspberries, you’ll love making these absolutely delicious Raspberry Cupcakes that are bursting in raspberry flavor. My husbands loves raspberries. So, I’m always looking at ways to add them to my baked goodies. I always want to use fresh raspberries because he doesn’t like the taste of raspberry extract. For most recipes it’s easy to add fresh raspberries, but not cupcakes. When I added fresh or frozen raspberries, or even a raspberry puree, the cupcakes turned a bluish-lavender color. They tasted great, just not the color I wanted. The reason for the color change is because raspberries contain anthocyanin, which is responsible for their wonderful red color. 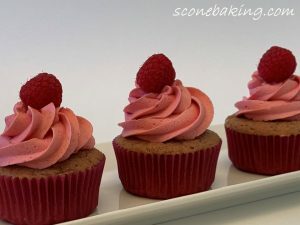 When baked, there is a chemical reaction with the batter of the cupcakes and the anthocyanin in the raspberries, which turns the final product the bluish-lavender color. To solve this problem, I found that I can flavor these cupcakes with raspberry preserves and raspberry yogurt (fruit already mixed in), which gave these cupcakes a wonderful raspberry flavor without changing the color. 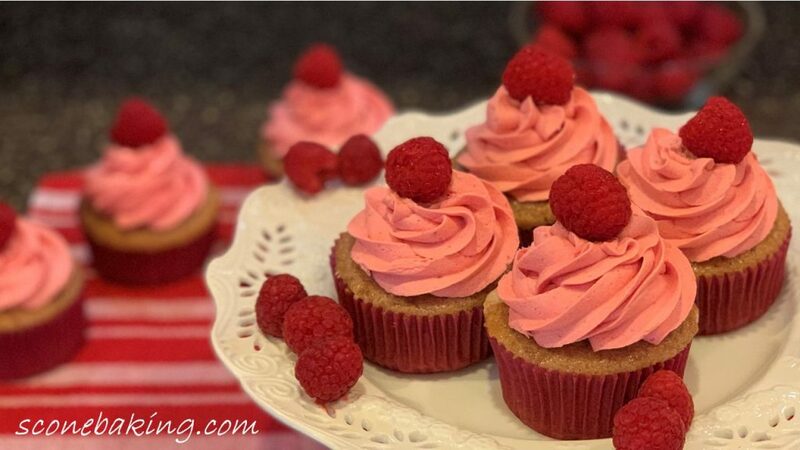 To give these cupcakes even more raspberry flavor, I topped them with a yummy Raspberry Buttercream Frosting. 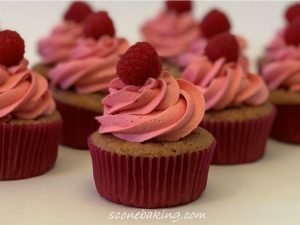 I made an easy raspberry puree to give the frosting a delicious raspberry flavor. And, or course, I had to top them with a fresh raspberry. 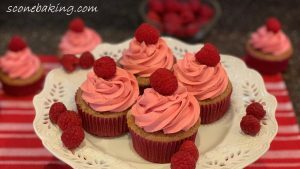 These Raspberry Cupcakes are bursting with raspberry flavor, and my husband gave them his seal of approval. Preheat oven to 350 degrees F. Prepare muffin tin with paper liners. Whisk together flour, baking powder, salt and lemon zest in medium bowl; set aside. In a small bowl, combine raspberry preserves and raspberry yogurt; set aside. 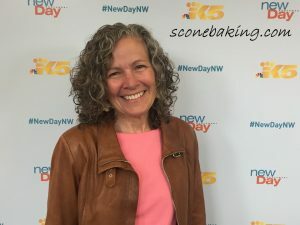 In a stand mixer fitted with paddle attachment, cream butter and sugar for 3 minutes; add eggs, one at a time on low speed until incorporated; add vanilla extract. Gently beat the flour mixture into the butter mixture, one half at a time, alternating with half the preserves-yogurt mixture. Beat until just combined; do not over mix. Divide batter evenly (using a #12 scoop) among prepared muffin cups (2/3rds full). Bake at 350 degrees F., 20 to 25 minutes, until skewer inserted into center of cupcakes comes out clean (internal temp approx. 205 degrees F.). Cool completely. In a large mixing bowl, beat butter until light and fluffy (5 minutes). Add sifted powdered sugar 1/2 at a time (beating 5 minutes each time). Add 3-4 Tbsp. raspberry puree to buttercream, beating for 5 minutes; add more as needed to get piping consistency (you may not use all of the raspberry puree). Fit 16″ pastry bag with 1M piping tip. Fill pastry bag with the Raspberry Buttercream Frosting, pipe on cooled cupcakes. 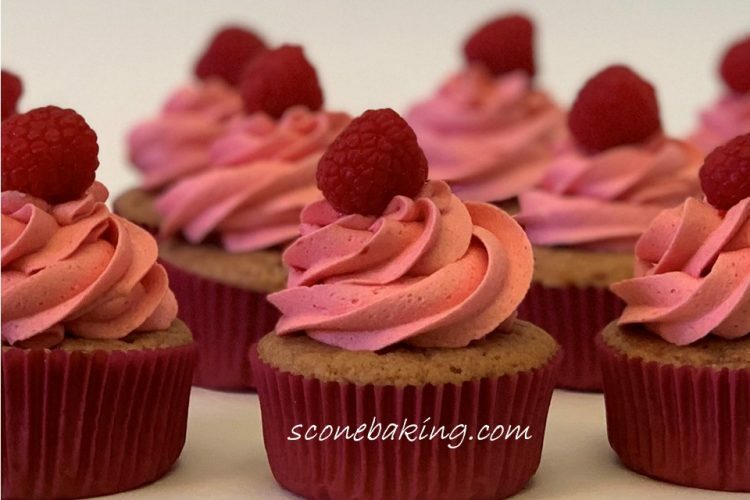 Top each cupcake with a fresh raspberry. Serve and enjoy! If not eating right away, store cupcakes in the refrigerator. They also freeze well.